Kudos to The Sun for running this story on its frontpage today. In any new development, it is compulsory to set aside land for social and community needs. Somewhere down the line, some would have access to information of these lots and this is how it begins. Powerful people would start getting approvals here and there, including from the local councils and Land office. Then the Exco would have approved them and MB would sign them off. This is how forest reserves, public spaces and recreational areas shrink overtime. In Bandar Utama, this is just the beginning of a long protracted war to stop this practice. This will be a key case to put an end to realienation of public land for personal profits. Heads will roll and powerful people will be named. And there is no doubt more of these cases in the state constituency of Bukit Lanjan, including Kampung Sg Kayu Ara, and probably in all state constituencies in the state of Selangor. To find out who the culprits who literally gave out these lands and then to recover them will not be easy. Powerful people and political parties are involved in this, and will not give up without a fight. We urge for your continued support to find remedies to this terrible wrong, to compensate the public for the loss of these lands, and to put a stop, once and for all – the practice of public land grab. PETALING JAYA (Aug 29, 2008): What was supposed to be land for facilities for the people in the up-market Bandar Utama township has ended up in private hands. All it took was for the previous members of the Selangor Executive Council to agree and for the then mentri besar to alienate the land to individuals, bodies, corporations – and even political parties. The result: the sprawling township does not have a fire station – on the land designated for it sits a used-car dealership. Even land meant for surau is in private hands – a car showroom and furniture centre. All in all, seven parcels of land meant for public amenities have been misused. When developer Damansara Jaya Development Sdn Bhd, submitted the layout plans for the entire area, the State Town Planner had indicated that land must be set aside for the common use of the residents, including schools, bus shelters, post office, etc. In this instance, the layout plan was submitted and approved in 1991 but the sale of the land took place much later – before March 8 when the people voted in a new government. Apart from the loss of the fire station and surau, what was meant to be a food court is now another car showroom, and what should have been a balai raya (community hall) is now someone’s home! Apart from this illegal use of land, an apartment complex sits on land meant for a secondary school. However, not all of these parcels of land have been alienated to individuals. Political parties have also got into the action and hijacked some of them. The land on which Parti Gerakan Rakyat Malaysia (Gerakan)’s building is located was meant for a telecommunications exchange, while the Malaysian Indian Congress (MIC) now owns a parcel of land designated for a Tamil school. Planning expert and Petaling Jaya City Council (MBPJ) councillor Derek Fernandez believes that the whole process of alienating the land was illegal since it is incumbent on developers to provide basic infrastructure when developing a township or residential area. “I can’t go into specifics as I don’t have the full facts, but according to the Town and Country Planning Act (TCPA) 1976, such land can be used only for the purposes specified in the layout plan presented by the developer. “Any attempt to amend that use will require a public hearing and I doubt this was done, judging from how the previous administration was doing things,” he said, adding that any change in the designation is illegal unless the zoning has been changed in according with the TCPA. Fernandez said as far as the present administration of MBPJ is concerned, any amendment to the developer’s layout plan, requires a public hearing. “Even after the hearing is held, we will ultimately decide on the propriety of the development, guided by the principles of public interest,” he said, adding that he will discuss with his colleagues at the council on the available remedies to this situation. ‘We are ready’ – for Putrajaya! On the ballot paper for P44, Anwar Ibrahim is the second candidate. For us, it symbolises ‘V’ – for victory – not just in terms of votes, but for victory of People’s Power. Even before a single ballot has been cast, Pakatan Rakyat has won for its commitment to multiculturalism and justice. The last ten days have seen the most racist and vilest campaign ever, launched by Barisan Nasional. I am too tired to upload photos of these publications. 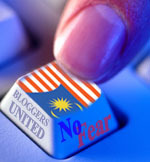 All that so-called reflection of BN after its devastating loss on 8th March was a whole lot of hot air. That so-called apology over the keris-waving of Umno Youth was as empty as Saiful’s ‘sumpah‘. Since 8 March, BN has not changed. There is no repentance, no remorse. Instead, this time round, they issue even more blood-curdling calls for vengeance against the Chinese and Indians. We have been called ‘babi’ (pigs), ‘bangsa asing’ (foreigners), amongst other derogatory terms. Leaders of MCA, MIC, Gerakan, PPP – buat tak tau aje. So this is the future that Barisan Nasional has in store for us. Anwar could have played to the gallery. He could have left out the bits about his vision about a truly multicultural Malaysia when he spoke in the Malay villages. He could have said, “You guys first, the rest second’. But he didn’t. He defended the right for all to coexist and work together for a better Malaysia. His courage to stand up for his vision humbles all of us. Our DPM may well have a future as a standup comedian, post-politics. “I don’t see why a public holiday is needed as the by-election is exclusively for the Permatang Pauh constituency. This (declaration) must have been a political decision,” he said during a speech at a meet-the-people session in Mengkuang Titi, Penanti. Which begs the question – why did the Gomen decide to hold it on a weekday then, if not to prevent outstation voters from returning, thus adding to BN’s political advantage? This was related to us by one of the reporters who was very tickled by an MCA minister with the same potential for comedic relief. During a press conference, a few days ago, at its operations centre at Sama Gagah, reporters grilled this Minister over the Umno anti-Chinese, anti-Indian propaganda materials, including the now infamous ‘cabinet babi’. One of the reporters then waved a copy and asked why then was MCA distributing it, if he didn’t have any knowledge of its existence. The Minister hit the roof. Accused the reporter of ‘planting’ it. So the reporters pointed to a corner of the centre, where a group of volunteers were busy clipping them in piles for distribution by MCA volunteers. The Minister was then forced to apologise. Three times, apparently. The two Perak Excos were charged in the Ipoh sessions court this morning. I know one of them, Capt Osman, who is my counterpart in tourism. Suffice to say, his arrest and that of his mates had nothing to do with corruption. If not for the brave magistrate who refused to grant the additional remand order, there could well be a new government in Perak by this week – a goal relentlessly pursued by Umno Perak. There were some preliminary objections this morning, including state jurisdiction. This will be an exciting case to look forward to – exciting as it will reveal the machinations of the BN state apparatus involving the ACA, the Special Branch and its links with Umno. Mention will be on 15 September. I am very grateful to my old schoolmate, Wende, who joined the legal team yesterday with her legal partner and brought in more firepower to defend these men. A beneficiary, who collected his ‘angpow’ this afternoon of RM 200.00 from MCA, was kind enough to drop the (empty) envelope at our operations room. Yayasan Kebajikan Negara is supposed to be for those households earning RM 700 or less a month. But at Permatang Pauh, you only need to register and give your IC number. So who is in charge of this Foundation? Many fear hellfire and brimstone but not Umno where swearing comes too easy for certain people. First it was Saiful, then Najib and now this f”ler. (New Straits Times) – Yesterday, it was Perak Umno Liaison Committee chairman Datuk Seri Tajol Rosli Ghazali’s turn to swear his innocence. The former menteri besar said he was not involved in any political conspiracy or plan that had resulted in the arrest of two Pakatan Rakyat state executive councillors for corruption this week.